Sarah O’Brien uses a standard recipe for making her irresistibly flaky crusts. So how come hers taste so much better than ours? “It’s all about the little things,” she says. Weigh your ingredients for optimum accuracy. Keep them ice-cold. Allow ample time for resting and chilling the dough in between steps. And move fast once it’s out of the fridge. Below, O’Brien walks us through the steps for making the crust for her toasted pecan tart (or two 9-inch pies). 1 Weigh 226 grams (2 sticks) unsalted butter, cut into tablespoon-sized pieces, and 340 grams (2 ½ cups) all-purpose flour. Refrigerate in separate containers until ready to use. 2 Whisk 4 grams (¾ tsp) kosher salt into ½ cup ice-cold water “until there are no pockets of salt, and it distributes evenly.” Refrigerate. 4 Drizzle salted ice water evenly over flour-butter mix. Toss with a fork until dough starts to come together. A few dry patches are okay, but if the mixture appears too dry, sprinkle in ice water. 5 Quickly combine dough in bowl, then place on a work surface and form into a ball. Divide in half and form into two balls. 6 Wrap dough in plastic wrap and refrigerate for at least an hour. 7 Remove dough from fridge and unwrap. Dust a dry surface with flour. Flatten dough slightly and form into a round or rectangular shape, depending on the pan’s shape. Lightly dust a rolling pin with flour, then roll dough to about 3/8-inch. 8 Briefly lift up dough and set it back down again, giving it a second to retract. 9 Lay dough across top of the pan and gently press it into bottom and sides, tucking it into crevices. (Crimp or trim overhang as desired.) Cover with plastic wrap and freeze at least one hour. 10 Before pouring in filling, line crust with parchment, fill with pie weights, and partially bake for 25 minutes (or until edges turn golden) at 350°F. 11 Remove weights. Prick crust all over with a fork to prevent puffing. Bake until bottom is set, about 5 minutes. Add filling and bake as directed. In this recipe, which may easily become your next holiday tradition, Sarah O’Brien creates a traditional pecan pie without the cloying sweetness. She bakes it in a narrow, rectangular tart pan, so that everyone can get an ample chunk of her ultra-flaky crust. (You can also use a 9-inch pie plate—just increase the cooking time). She subs in granular, creamy-textured cane sugar for the plain old white variety and adds smoothness with heavy cream and a shot of bourbon. Toasting the nuts “brings out a savory, meaty,” flavor, she says. Finally, she tops the pie with a sprinkling of flaky Maldon salt just before baking. If you’re making the tart, you’ll have a good bit of the custard filling leftover. Either plan to make two or pour the extra sauce over a scoop of ice cream. Preheat oven to 350ºF. Place corn syrup, cane sugar, brown sugar, bourbon, and kosher salt in a saucepan. Bring to a boil and cook, whisking occasionally, for about 1 minute, just long enough to dissolve sugars and salt. Remove from heat. Add butter and vanilla; whisk until butter melts. Let cool slightly. In a small bowl, whisk together eggs and cream. Add to sugar mixture; whisk until combined. 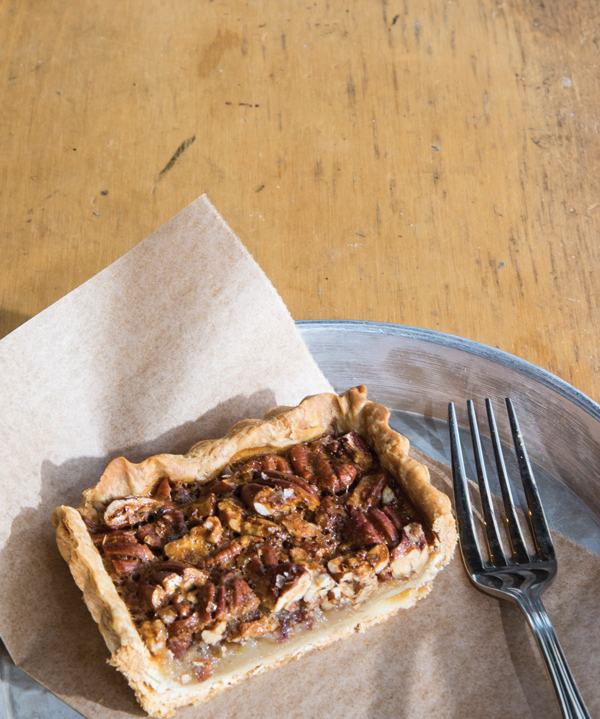 Fill prebaked crust with pecans. Pour filling over pecans; sprinkle lightly with Maldon salt. Bake until filling is set: 45 to 50 minutes (for tart pan); 55 to 60 minutes (for pie pan). Serve, or refrigerate up to four days. O’Brien’s grandmother gave her a rolling pin on her 10th birthday, and she’s had an unflagging pastry obsession ever since. 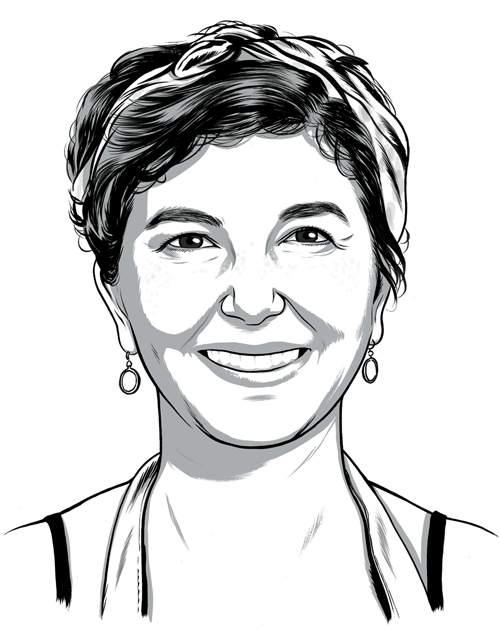 She first sold her baked goods at farmers markets before opening the Little Tart Bakeshop in Grant Park in 2011, followed by an outpost in Krog Street Market.